I had a chance to review products from one of my favorite drug store lines - Biore. I actually really like this company. They keep coming out with new and innovative products and I've been using their stuff for years. Today I'll be reviewing one of their new products as well as a staple in their line. The first product I received was a box of Biore Pore Strips. I've been a fan of these pore strips for years. I have super clogged pores on my nose and have tried just about everything to fix them. These strips are the only thing that seems to truly declog and shrink them. Even the boyfriend uses them too! For those who don't know...you apply this paper strip to your nose after you've dampened it with water (see picture above). The water activates the sticky side and the strip adheres to your nose and the clogged pores. After 10 minutes, you carefully pull this off and all the gunk, white heads and blackheads come out with it. I've tried imitation products before and not only do they end up hurting more, but they don't get as much out! 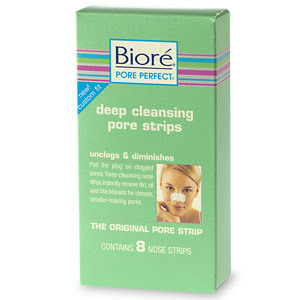 To me, there really isn't a product out there on the market to compare to the Biore Pore Strips. The next product I tried was the Biore Makeup Removing Towelettes with Green Tea. I gave myself a good couple of weeks to test out these new wipes. I'm very sensitive to skincare products and have to give my skin time to adjust. I've used nearly the whole pack and I feel confident in giving the thumbs up. These are a great value for drugstore wipes. They don't leave a residue like some and do not completely dry out the skin either. They're not super soft, but not rough either...just in the middle. The scent is pleasant and refreshing. I only wish they'd have the plastic pop open lid instead of the sticker to help prevent drying. Besides that, they're pretty good! Biore products are available for a great price at your local drugstore. Check them out! FTC Disclosure: I was sent these products to review. I was not paid and not affiliated with the company. These are my honest thoughts and opinions. Both products look great! I'm huge Biore fan too. Their ice fighting blemish cleanser is amazing. I agree, Bioré is great! have you tried the face shop's nose pore mask strip thing? Or the naris blackhead peel off? those things pull out some nasty stuff! LOL! Gaby, if you're worried about a nose ring and are looking for a good product to use, try Queen Helene Mint Julep Masque. It's great for deep cleansing skin that is prone to pimples and enlarged pores to leave skin feeling refreshed and smooth. Follow the link below to get a coupon for $1.00 off and give it a try. Hope you enjoy. I used to use the biore pore strip in the past, but I just tried the face shop black head ex(charcoal pore strip) It is the same as the biore one but I feel that it fits nose shape much better. just wanted to add it's *very* important to prep your skin properly before using these! I'm an esthetician and used to do extractions for a living LOL--these pore strips can be a great thing but if the skin is not prepped could potentially cause trauma to a pore--i.e. rip it. Once a pore has been ripped open like that, it can never return to its original size and will be forever bigger. And then get even more gunk in it LOL! the best time to use these is after a shower so your skin has been steamed and your pores are nice and open. Just my two cents! @ Megan...how should we prep before using them, so as not to damage the pores? I think I might have to try those out! Great post!